A successful resource company requires expertise in all aspects of its matters, whether it is at the initial stages of exploration on a project, moving forward with a resource estimation or assisting in corporate direction. Fladgate provides highly qualified people no matter what your needs; from the bush to the boardroom. Our office is staffed with professional geologists, geotechnicians, GIS technicians and office staff to manage projects ranging in size from grass roots to mine site exploration. See the properties around the world where Fladgate and employees have previous experience. 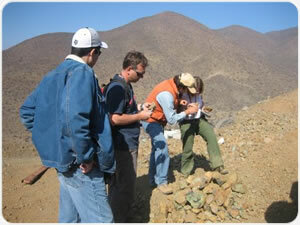 Fladgate Exploration Consulting Corporation is a full service mineral exploration consulting group. Our staff is comprised of several professional geologists, geotechnicians and office staff, each bringing their own unique skill set to the team. Staff experience ranges from grass roots to mine site exploration and mineral deposit expansion. Professional backgrounds include gold, diamond, Cu-Ni-PGE and base metal exploration, oil and gas exploration, international consulting, planning and 3D modelling. We manage all aspects of mineral exploration programs from data compilation and project design through all levels of implementation and management. © 2019 Fladgate Exploration Consulting Corporation, All rights reserved.